Red Wing Shoe Stores are the premier destination for modern craftsmen seeking premium work footwear and personal service rarely experienced at retail today. They were developed in the 1950s to provide workers with a broad selection of high quality, purpose-built work boots and personal fitting by qualified shoe experts. 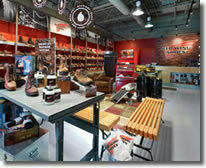 Owning a Red Wing Shoe Store represents a unique investment opportunity. Stores enjoy strong year-round business, healthy margins, low expenses, great brands and significant ROI potential. They represent a clean working environment, require only a limited number of employees, enjoy reasonable retail hours and are supported by the full array of experts at Red Wing Shoe Company. Red Wing Shoe Company's history of growth and success, private ownership and comprehensive training, marketing and retail support make owning a Red Wing Shoe Store a smart business decision. 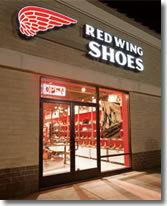 Click on Request Information button above for FREE information on how to start a Red Wing Shoe Store franchise today! Please Note: Red Wing Shoe Store opportunities for sale, and other franchise opportunities, business opportunities, businesses and franchises for sale on this web site are not to be considered as an "offering", "franchise offering", suggestion or recommendation by GlobalBX. The franchises, businesses and business brokers seen on this web site submit their own individual content. This advertisement depends entirely on the truthfulness of the information provided by our advertisers which includes, but is not limited to, franchisers, franchises, franchise brokers, franchise consultants, business sellers and business brokers. As always, GlobalBX recommends that you consult a lawyer, financial consultant, accountant or professional advisor before buying a franchise or business opportunity or any type of business. By submitting this form and requesting more information, you have agreed to all terms and policies of GlobalBX and the business and franchise offerings listed here. Please review our Terms & Conditions for more information.